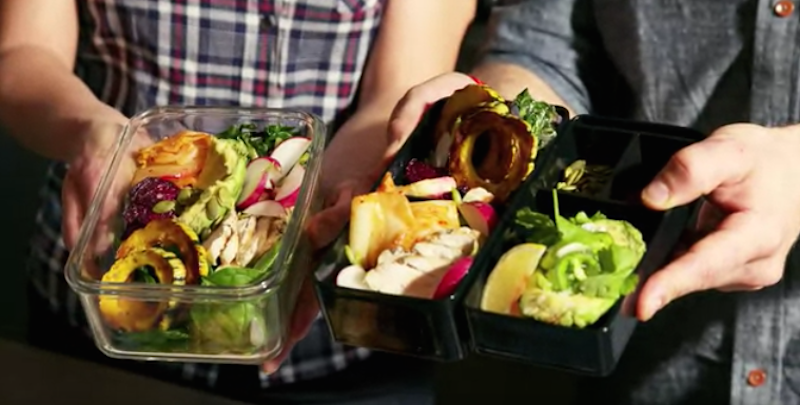 Packing your own lunch saves money and gets you to eat healthier, but finding combinations that both taste great and fill you up is tough. This formula makes sure you always have balanced, delicious box lunches. Grains: Anything from rice to quinoa, this will act as the foundation of your meal and be integral to staying full the whole afternoon. Obviously optional if you're watching your carbs. Seasonal vegetable: You can throw in more than one veggie, whichever ones you happen to have on hand. This is a great layer to use up roast veggies from last night's dinner. Leafy green: Raw or cooked, greens will bulk up your lunch, and if you're cutting out grains or watching your carbs, switch these out as the base of your lunch for a fibrous, healthy alternative. Protein: Tons of ways you can go here, from sliced chicken, cured meat, tofu cubes, beans, or a hard boiled egg. Sour/acidic flavour: Lighten things up and pull your dish together with an acidic dressing, sauce, or even just a squeeze of lemon. Healthy fats: This is your chance to really customise each day's lunch, from olive oil to avocado to nuts. If you're planning to make these in bulk by cooking batches of grain, veggies, and protein on Sunday to get through the whole week, the healthy fats and sour layers are where you can make each lunch really stand on its own when it comes to flavour. For more suggestions and specific meal combinations, hit the link below.